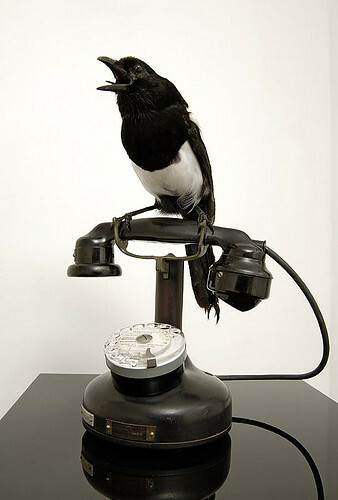 [Polly Morgan, For Sorrow, 2007]. 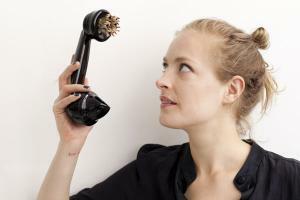 In a game of word association, “art” might make people think of paintings, sketches, canvases or a specific artist like Jackson Pollock (paint splatters, oh my) or the Mona Lisa (very tiny, strange smile). Disciplines such as sculpture, ceramics, and taxidermy might not be mentioned, because they’re sidelined in favor of the mainstream. Etsy and Deviant Art are full of intense paintings; children bring home scribbles from school that are kept on the wall for years, but there’s a weirder and larger side to art. The 1990s was a time of spider obsession for sculptor Louise Bourgeois, who had been producing elongated pieces for decades but finally settled on depicting these arachnid forms. 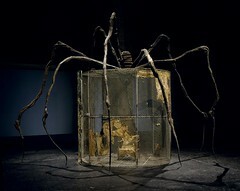 This large-scale animal offered a chance to combine a partially enclosed area (the spider’s legs) with vast open sections. There is a feeling of danger but also of control—we could be wrapped up by the spider but could always escape. The piece Maman (Mother) is linked to Bourgeois’ difficult childhood, which involved a stern father who gave her little praise and took her nanny as a mistress. Bourgeois is known as a confessional artist for the role that her personal life plays in her work, creeping in more openly than that of creatives who claim to be inspired by the world around them rather than their own experiences. 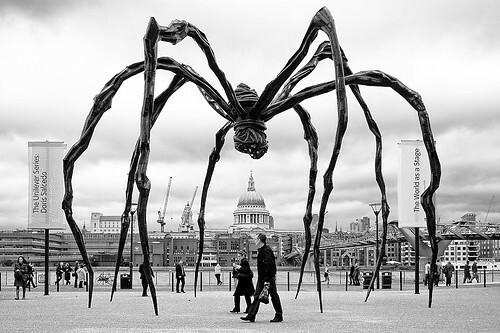 When Bourgeois showed Maman as an outside sculpture at London’s Tate Modern gallery it was much loved by children for its unofficial role as playground equipment—though they probably didn’t appreciate its appropriate name—showing how something which seems initially terrifying and akin to a nightmare could also become a source of fun for kids. Bourgeois explored the spider repeatedly as a motif, adding in cages underneath which simultaneously suggest its prey or its guarded secrets. 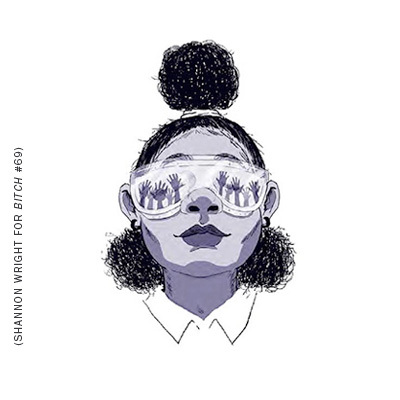 She has tapped into a visual imagery that is intensely appropriate to her own life but also speaks to other people, and it’s not surprising that she kept going back for more. 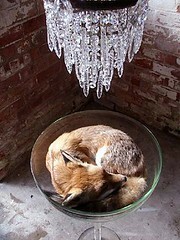 [L-R: Still Life After Death (Fox), 2006; Polly Morgan with her piece, Receiver, 2009]. Choosing not to use animals unless they are roadkill or have had to be put down by vets, there is an ethical perspective to Morgan’s creations, which seem to give the animals dignity after they’ve died. She comes from an animal loving family and grew up with a menagerie of pets, including llamas. There is a tongue-in-cheek humor at times if you look at a Polly Morgan original, such as her fox curled up as if asleep, or her chorus of small birds bursting from a phone receiver. She also gives a nod to Victoriana with old-fashioned elements such as cloche bell jars, and it feels as though many of her pieces may have come from a travelling show of historical curiosities. Her ornate flying machine called Departures, which fits in nicely with the current fashion and lifestyle trend of Steampunk, sold for an incredible £85,000, which just goes to show that there’s a market for unorthodox art, if only you know where to look. [Jessica Harrison, Ruby, 2010; Susan, 2010]. 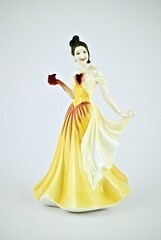 You might recognize those strange little figurines that some people like to collect—the ones with names like “Estella” and “Lucy” who gaze poetically into the distance whilst holding bouquets of flowers. A lot of them end up in antiques fairs or charity/goodwill shops, living out sad existences on the shelf. Artist Jessica Harrison took them as the inspiration and medium for her ceramic art, which adds a gut-filled twist to the normally respectable and, let’s be honest, quite dull collections. I came across Harrison’s work on the site Regretsy, which tends to point out dodgy purchases from Etsy that you or your small child could make yourself for half the price. 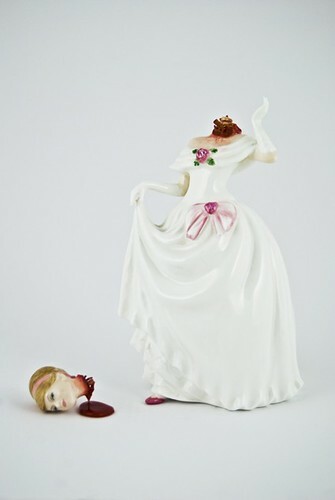 Regretsy chose Harrison’s bloodied women as a rare example of great Etsy finds that are incredibly niche but also really inventive. I, for one, would quite happily have a Jessica Harrison lady on my shelf at home; it’s subversive, intelligent and certainly a talking point. [Grayson Perry, Golden Ghosts, 2001]. 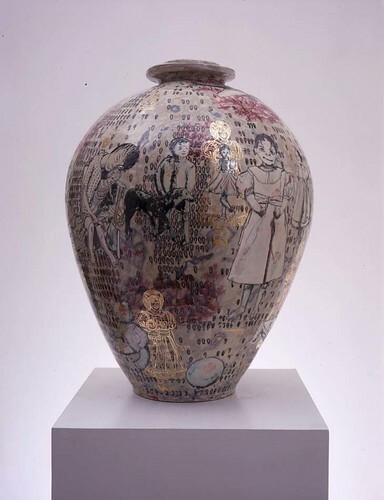 Another great ceramic artist is the transvestite potter Grayson Perry. Whether working as himself or his alter-ego Claire, Perry gives us richly detailed pots that are filled with pop culture references, drawings and text. You won’t be able to tear your eyes away from Golden Ghosts, which features Claire as a spindly gold figure alongside a girl who is affected by the Chernobyl nuclear disaster, amongst other examples. There is so much going on inside Perry’s head that has been poured out into his pots and plates that it’s sometimes hard to keep up, but he has managed to resurrect pottery and get a new generation interested in this discipline, without any references to that scene in Ghost. All of these artists chose not to stick to conventional subject matter or media. Louise Bourgeois revisited a tricky childhood through a striking motif; Polly Morgan learned to be a taxidermist and it led her to a career; Jessica Harrison and Grayson Perry revived the stuffy ceramics industry and brought it back to life, with perhaps the same aplomb as Polly Morgan does with her stuffed creatures. In art, it certainly pays to think outside the box.